Griffin invests in the lives of students to challenge them in their spiritual walk, encourage them to fulfill God’s purposes for their lives and develop them as disciple-makers. Dale Griffin serves as assistant vice president for spiritual life and dean of the chapel and was recently named interim dean of students. A 1984 OBU graduate, Griffin spent most of his life working with college students. He came to OBU as an employee in 2002 having served as director of the Baptist Student Union (now called Baptist Collegiate Ministries) at the University of New Mexico. Q: Why is it important to have an office of Spiritual Life? The role of Spiritual Life is to foster that kind of spiritual fervor in the context of personal development in the academic disciplines. We “hope great things” as we foster Bible studies, service projects, worship opportunities, global engagement and personal devotion. Spiritual Life is made up of Student Ministry, the Avery T. Willis Center for Global Outreach, the OBU Center for Discipleship and chapel. 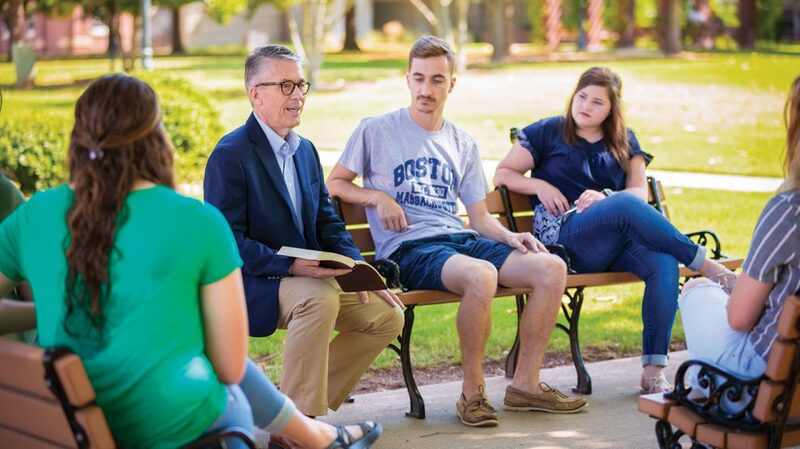 Students experience spiritual life initiatives integrated into the entire OBU experience. Residential life, athletics, individual colleges and affinity groups all have spiritual formation elements for personal benefit. Q: What services can a student expect from Spiritual Life? A: Through initiatives fostered by Spiritual Life, students have opportunities to be discipled by peers, faculty and/or staff. We offer Noonday lunches on Wednesdays for fellowship and encouragement provided through the support of local churches. Students can participate in Global Engagement trips and events including Global Outreach trips, “Going Green” academic trips, international studies and extended times of service. We offer worship opportunities at Canterbury every other Thursday evening, chapels on Wednesdays and Connect chapels on select Fridays. Students can serve the local community through the ministry of the local church and service projects in the immediate area. They can discover resources for personal growth, develop as a spiritual mentor and ministry leader, and so much more. Q: What are some of the long-term goals for Spiritual Life? dynamic relationship with God, sending laborers out to the nations to worship him. The call is centered around the gospel. Our relationship with God comes to us in gift form only. That gift is to be opened and enjoyed. Therefore, we desire for every student to have a dynamic relationship with God as he speaks over them his faithful love. Receiving that love sends the student on a quest for responding to that love by loving God in return with their whole heart, soul, mind and body as he develops them to go into all the world with their many gifts and talents to bring glory to God in every field of study and endeavor. That is a lofty goal. And yet, it is a goal achieved year after year as graduates leave OBU to see the world transformed through their God-directed lives. Q: What are some things that people may not know about Spiritual Life? only certain people to enjoy. It is a way of thinking and interacting while a student at OBU. The Spiritual Life staff includes Dr. Joy Turner, director of the Avery T. Willis Center for Global Outreach, and Clay Phillips, director of student ministry and the OBU Center for Discipleship. Student ministry associates are recruited each year to foster discipleship in residential life and to assist with the details of Spiritual Life initiatives. Student workers also play a significant role in the day to day details. But, we could not complete the task without churches that volunteer for Noonday, road trips, service projects and more. And much of the work depends on volunteers who serve as chaplains, disciple-makers, GO Trip mentors, peer leaders and so much more. Q: What are the most rewarding aspects of your position at OBU? A: One of the most rewarding aspects of the job is seeing how the chapel program develops each year. So many voices are involved in the process, and yet, one cohesive theme and program emerges. But the greatest reward is the joy of seeing students transformed through the overall OBU experience. To know that Spiritual Life has played a significant role in the student’s overall transformational experience keeps me motivated for the next year. It encourages me to believe God for more and pray with fervency for another generation of God-honoring students in training on Bison Hill. Q: What should prospective students know about Spiritual Life at OBU? A: If a student is looking for a university that keeps Christ at the center of the overall experience, if the prospective student wants an integrated rather than club-like Christian experience in college, if the student wants to participate in something much larger than they are individually, and if the student wants to be challenged in their spiritual walk while experiencing the best in academic excellence, they need to give OBU the highest consideration.